Raising Z and Lil' C: Time to Party!!! Look who is swimming without a bubble!!! On Saturday mornings I try to find a little quiet time to sit down and plan out the week ahead. This Saturday I was so excited to see all of the celebrations on the calendar. 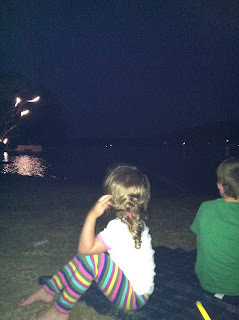 There were 5 BBQs scheduled (3 of them birthday parties) and two chances to see Fireworks! It was going to be a festive week and this mama was excited. Here are some photos of this past weekends pool parties and fireworks. Everyone had so much fun at both pool birthday parties and Z barely got out of the water. Auntie Kristen invited us to watch fireworks at her house for Lil'C's first time. Lil'C was not so sure what to think about this tradition. She loved the bright colors and the fact that they weren't too loud from where we were sitting on the beach but she did not like the neighbor setting them off from his dock :) On the walk back to the house Auntie caught a firefly!! It was the first time the kids had seen one up close and they were excited. It was a great weekend and thankfully today is a rest day before the rest of the party week! We will go up to keep my mom company this afternoon but thankfully that will be low key :) I hope you have a wonderful 4th of July week. Our fireflies put on a show here last week. More in the fields then ever. So pretty looking out at them from the deck. A little sea of twinkling lights. Was always a special moment here when the fireflies appeared, especially for K. They are our field fireworks and they don't make any noise... !!! Here's to memories and Independence Day! Scott Has Joined me on GAPS!! !